I have recently purchased a Sig P229 Emperor Scorpion 9mm as a carry gun. I would like to get it (besides the sights) to match my Legion P229 9mm as much as possible, which I also carry. Since I had changed out the P229 Legion (GG) Trigger for the sig short reach trigger (small hands)....and the Scorpion already comes standard with that trigger....I believe the only thing left is the guide rod. 1. What is the diameter difference between the two guide rods....standard vs gray guns fat rod? Can this cause any failure issues for a carry gun? 2. Does this diameter difference cause a problem with the original OEM springs? Is it a REALLY tight fit or does it slide on, pretty much, the same way as the OEM part? 3. Any resistance in the spring, guide rod mechanism during functioning (squeaking, scrapping, tightness, etc.)? 4. Have there been any issues in reliability in the P229 when switching over to the GG guide rods? Don't want to add an issue that does not exist. 5. ****I am ESPECIALLY concerned about FTE's (Failure to Extract/double feed) issues. CAN'T have this in a carry gun. **** Any problems with this? I don't know the answers to your questions. My impression is that you are over-thinking the importance or affect of the guide rod. I have used the GG "fat rod" in several guns and never noticed any significant difference in performance and none detrimental. Thanks for the response. Your probably right, however, once you've had that FTE problem I mention, for like 3yrs with no resolution, in a carry weapon.....it makes you a little gun shy. Just trying to minimize that possibility again....sigs aren't cheap. 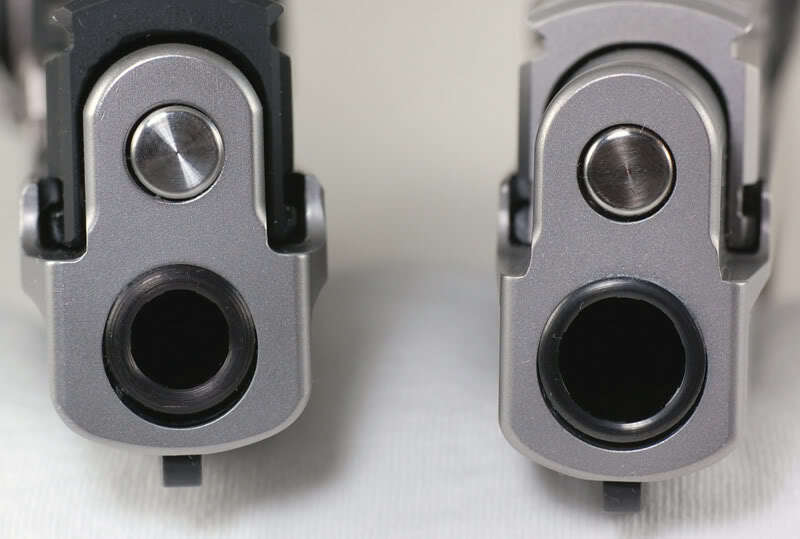 I have Grayguns fat rods in several of my Classic line SIG pistols and have never experienced problems with any of them. Are they of much value? Depends. With a little more room between rod and frame, the recoil spring would escape through the hole and cause a “jam of death” (as I believe Bruce described it). That possibility is more likely with a single wire aftermarket spring.